Exciting news! SourceIT has been shortlisted as a finalist for the THINKTECH €1 Million project to develop ideas for a better Ireland. The finalists will take part in a development programme devised by Social Innovation Fund Ireland and supported by Google.org & the Department of Housing, Planning, Community & Local Government. Click here for more information. SourceIT is an online platform, developed to support and empower social enterprises through the streamlining of their processes and systems. This leads to better capturing, management, visualisation and presentation of data through digital mapping. The platform offers greater visibility on quantities, capacities and locations of waste materials and also streamlines the logistics and transportation required for efficient reuse and recycling. Source IT not only provides enterprises with valuable resources to help operationally, it also profiles the enterprises as a sustainable, stable and efficient method of doing business. SourceIT is run by Macroom E, a wholly owned subsidiary of Cork County Council located in Macroom, Co. Cork, Ireland. Macroom E is a dynamic community enterprise centre dedicated to helping start up and growing businesses in the Lee Valley region. Macroom E aims to improve your social enterprises’ processes through digital innovation, by accurately mapping resources and waste materials for efficient collection, recycling, monitoring and reporting. It is estimated that we send between 400,000 and 600,000 (this calculation is based on 1.5 mattresses per head of population being changed every 10 – 15 years) old mattresses to landfill every year in Ireland. Civic amenity sites and waste management companies all around Ireland are disposing of mattresses to landfill. The European Waste Framework Directive (Directive 2008/98/EC on waste) includes two new recycling and recovery targets to be achieved by member states by 2020: 50% preparing for re-use and recycling of certain waste materials from households and other origins similar to households, and 70% preparing for re-use, recycling and other recovery of construction and demolition waste. While mattresses are not yet banned from landfill, it is certain that they will be in the very near future. The SourceIT online platform can assist in the tracking of waste mattresses, streamlining their collection and incentivising the creation of new matresses reuse / recycling enterprises througout Ireland. Waste tyres are 100% recyclable and according to the 2003 Landfill Directive, tyres can no longer be burned or buried. They must be recycled adequately. The waste tyre regulations were introduced in 2008 and they imposed obligations on persons who supply tyres to the Irish market and waste tyre collectors to submit quarterly reports on tyre flows to either their local authority or the compliance scheme they are participating in. In a review of the Producer Responsibility Initiative for tyres and waste tyres by the Department of the Environment, Community and Local Government, it is noted that this system is not tracking waste tyre flows as well as intended. While the level of illegal storage seems to have reduced, there is still a high level of non-compliant businesses and significant quantities of tyres and waste tyres unaccounted for. 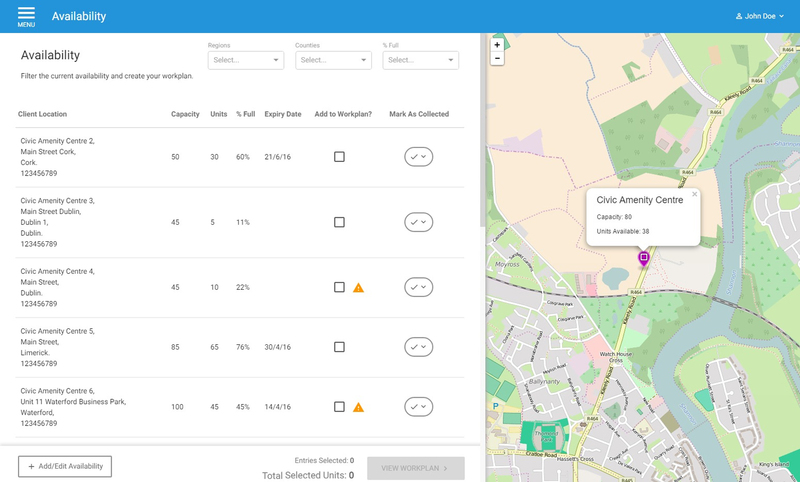 The SourceIT online platform can assist in the tracking of waste tyres in Ireland and making their collection simpler and more streamlined for tyre recyclers. In recent years there has been a growing concern regarding the state of the ocean ecology due to marine litter waste. One particularly troublesome ocean waste fraction consists of abandoned, lost and discarded fishing gear, including fishing nets. The problem is two-fold, firstly the plastic marine pollution, and secondly the direct damage to the wild ocean habitat through “ghost net fishing”. This term refers to the discarded and drifting nets which continue to catch and kill fish and sea mammals for many years before eventually ending up as waste in marine gyres or coastal areas. A UNEP report of 2009 estimated 6.4 million tonnes of ocean litter discarded into the seas per year, and estimates 10% of this is in the form of fishing nets, so about 640,000 tonnes of fishing nets end up as free floating ocean waste annually. The SourceIT online platform can be used to locate and quantify discarded fishing nets which have been brought ashore thereby making their collection for reuse and recycling more straightforward. SourceIT was originally developed to support social enterprises involved in the environmental arena with their operational activities. However, the online platform was designed from the outset to be adaptable and applicable across a wide range of sectors and enterprises. If you think SourceIT could be useful to your enterprise, please contact: info@sourceit.ie or +353 (0)26 205 20 to discuss your needs with one of the team. Follow us on Facebook and Twitter to stay up-to-date with the latest updates and news.